The few comments which have been posted to this blog about the decision to sell the 124 acres the School Board owns near Homestead Park have been mostly negative, criticizing us for putting this parcel in the hands of a home builder, Rockford Homes. I understand those feelings, and perhaps should be somewhat gratified that this criticism has to some degree been fueled by my many years of trying to inform folks about the burden placed on all of us when residential development outpaces commercial development. Without that effort, I suspect few would have been concerned. I certainly wouldn't have been ten years ago, before beginning this journey. So I recognize that my agreeing to this sale (by voting yes on the resolution) seems incongruent with my long-held position. I'd like to tell you that I did a substantive financial analysis before making my decision. I obviously didn't, because I would have included that analysis with with my prior comments. Rather my reasoning was this: we didn't go out soliciting offers on the land, but a couple of them came to us anyway. One was from some folks who wanted to build athletic fields on the property, one was from a homebuilder. Hands down, our preference was for the athletic fields, but it would have required the School Board to act as the lender, and none of us were comfortable with that. Had that group been able to secure private financing, I'm fairly confident that this use would have been the preference of the Board. Meanwhile, we also had an unsolicited offer presented to us by Rockford, and we have the fiduciary responsibility to give such offers consideration. There was some back and forth about price and terms, but eventually a reasonable position was reached, and we accepted the deal, albeit with significant contingencies reserved by Rockford. Notably, Rockford retains the right to back out of the deal if the City of Hilliard does not grant the necessary zoning and permits to support a development plan Rockford would find economically viable. I just couldn't see us passing up the opportunity to recoup 80% of the money spent to buy the Grener property and to put that money to use, rather than continuing to own the most expensive cornfield in the area. Scenario 1: The school district buys the land for $6.2 million, financed by 20 year bonds, and holds it forever. Our debt structure is a little complex, so I'm going to use a cost of capital of 4.8% based on the weighted average coupon rate on our outstanding bonds. This results in annual debt service of $486,000 - about 0.2 mills. That's $6/year per $100,000 of home value. 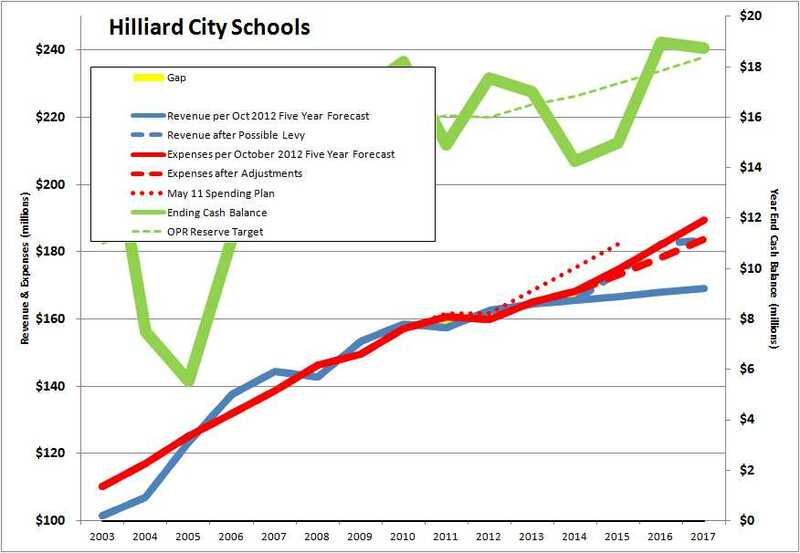 Then in 2013, the School Board authorizes the spending of $4.8 million on capital items. The debt service on this amount would be 0.16 mills, or $4.75/yr per $100,000 in value. The total debt service would be $11/yr for 20 years per $100,000 of value. Then the investments would be paid off, and there would be no additional cost. Scenario 2: Had the school district never purchased that land, I think we could be pretty confident that some homebuilder would have purchased it anyway. The real estate market in our school district was still healthy in 2003 when this land was purchased (much of Ballantrae was built out during this period), and this parcel was particularly valuable because there was access to the water/sewer network. So let's say that the Grener property was bought by a developer who built on the parcel about 375 houses which sold at an average price of $250,000. From those parcels, we could expect 300 kids entering our schools, using the long-standing ratio of 0.8 kids/new dwelling. At $11,398 spending per student in our district, this would generate a fully-loaded incremental cost of about $3.4 million. The incremental school taxes generated by the new homes would be about $1.6 million. If we assume zero incremental funding from the state or federal government, then this would put a $1.75 million burden on the rest of us to subsidize these new kids. That's the equivalent to 0.7 mills, or about $22/year per $100,000 of home value. Then as in the first scenario, the Board authorizes $4.8 million in capital spending in 2013, again resulting in a cost of $4.75/yr per $100,000 home value. This results in a tax burden of $27/yr per $100,000 of home value. Of course in this case, the $4.50/yr goes away after 20 years, but the $22/yr is forever, and increases with the rate of General Fund spending growth. Scenario 3 - Reality: The school district buys the land for $6.2 million, then sells it to a homebuilder ten years later for $4.8 million net. The debt service on the $6.2 million is as above, $6/yr for for 20 years for each $100,000 of home value. Also as above, the cost to subsidize the additional kids in the school district would be $22/yr, forever. However, the $4.8 million capital investment will be funded with the cash received from the sale of the property. This means that cost of this scenario is about $28/yr per $100,000 of home value, pretty close to the second scenario. I know this is a tortuous analysis, and I'll confess again that it is after the fact. But the point is that the next most likely scenario to what actually happened is for a homebuilder to have bought the Grener property anyway, putting us in substantially the same position. The notion that it would have remained as a farm field had the school district not purchased the land is not realistic in my opinion. You might also argue that the $4.8 million capital investment might never be made had this amount of cash not been freed up with the sale of the property. Again, I would point out that there is a list of routine, periodic maintenance items which will exist as long as the school district continues to own buildings and property. We will also need to make strategic technology purchases, such as the replacement of rediculously expensive paper textbooks with e-readers. Now is not quite the time to do that, but it will be coming soon. If it is your opinion that it is a good use of taxpayer money to buy and hold land to keep it out of development (which I'm not sure a school board is authorized by law to do), then you would also advocate for and support additional bond levies to purchase, for example, the several thousand acres on the west side of Alton-Darby Rd, nearly all of which is currently owned by developers who are eagerly awaiting the right time to harvest a nice new crop of houses. Otherwise continuing to hold the 124 acre Grener parcel is a futile gesture to arrest development, as I said in the earlier article. The control of the direction, pace and mixture of development in our community is the responsibility of the municipal governments - ie the Cities of Hilliard, Columbus and Dublin - not the school district. You may have noticed that the School Board has met in executive session several times recently, as provided by Ohio Revised Code 121.22(G)(2), to discuss the sale of property. The property in question is the 124 acres located between Leppert Rd and Cosgray Rd, east of Homestead Park. Folks who have been around for a while may recall that this land was originally purchased by the District to be the site of the third high school. It was at a time when the community was growing rapidly, and the school district was growing by hundreds of kids each year. Without question, more space was needed to house students at all grade levels. There was plenty of debate about whether we should just keep expanding the one new high school which we had built in 1989, now known as Davidson High School. The decision was made to build a second, nearly identical high school - Darby. As Davidson and Darby filled up, again the debate began about whether to add on to those two buildings, or to construct a third school. A third high school was decided on, which meant that a substantial piece of land needed to be found. Although our school district encompasses a lot of land - about sixty square miles - a new high school couldn't be built just anywhere. First, at least 100 acres of land was needed, and preference was to find a willing seller rather than go through an eminent domain proceeding. Then the price needed to be reasonable. One of the most complex aspects of the land search has to do with the availability of water and sewer services, and as you can imagine, a school housing a couple thousand students and staff needs a lot of both. This makes a great deal of our sixty square miles unusable since the water/sewer system effectively ends at Alton-Darby Rd, making nearly all of Brown Twp undevelopable - at least for now. However the property on Leppert Rd, which was owned by the Grener family, met all the criteria, and in 2003 it was purchased by the School Board. For reasons that I still don't fully understand - and I'm not looking to reignite the controversy here - a movement erupted to force the School Board to not build a high school there after all. One or perhaps two bond levy issues were defeated, meaning that even with the land secure, there were no funds to construct the school building. This caused the School Board to begin a search for alternative land. The land they found was property owned by the Emmelhainz family on Walker Rd. While this parcel is not all that near the existing water/sewer facilities, the School Board at that time felt the urgency to get the third high school built, and took the steps necessary to allow the Emmelhainz property to work. Today, Bradley High School stands on that site. Meanwhile, the District still owns the property on Leppert Rd, representing several millions of dollars in "stranded capital." While I can make a reasonable argument that the people of Hilliard are better off letting that land remain a farm field than we would be if hundreds of new homes were to be built on it, in reality this isn't the last piece of developable land left in our school district. In fact, we are soon going to see several hundred new dwellings built on the west side of Alton-Darby Rd just south of Davis Rd. After that, there are still thousands of acres waiting to be developed. All things considered, it doesn't make sense to continue paying debt service on several million dollars in a futile attempt to arrest development in our school district. Better to put that money to work. After considering the options before us, we have decided to put a resolution on the agenda to consider the sale of the Leppert Rd property to Rockford Homes. They have offered $40,000/acre for the +/-124 acres, yielding about $4,960,000, less a 3% brokerage fee. As I recall, we paid $50,000/acre for this land, so we're taking a loss on the transaction, but it's a good price for the land in today's market. Remember that the land for Bradley High School was purchased for $25,000/acre. What's going to happen with this money? One choice might be to use it to reduce the amount of money which has to be collected in property taxes for debt service, but it wouldn't amount to much to us individually as taxpayers - maybe $60 per $100,000 of market value, and just for one year. So it is proposed that the money be added to our Permanent Improvement Fund, and used to accelerate the long list of items on the maintenance schedule. This is authorized by the original language of the bond issue, which says the money raised could be used for "improving, constructing, reconstructing, renovating, remodeling, enlarging, furnishing and equipping (including with education and safety technology) buildings and facilities and acquiring and improving sites for school purposes." I am in support of this sale and the proposed use of the funds, and will be voting in favor of the Resolution authorizing President Andy Teater and Treasurer Brian Wilson to sign the sale agreement. E3 and E3 to approve new contracts for a number of teachers, tutors and other certified staff members. Some are being offered new contracts for the same term as their current contracts, some are being offered contracts for longer terms, and a few are being offered Continuing contracts, which is often referred to as "tenure." This process is in accordance with Article 10 of the Collective Bargaining Agreement in force between the Hilliard Education Association (the teachers' union) and the Board of Education. Approval of the Physical Education Course of Study, which was presented to the School Board at our last meeting. The third reading and adoption of a number of policies. Congratulations to all those who will be receiving Continuing Contracts. We're fortunate to have you on the team! That last tax document finally arrived on April 13, allowing me to get our 2012 Income Tax returns filed on time. It's kind of amazing the degree of stress and havoc a couple of pieces of paper can create in this annual ritual. Of course, it's not the investment that generates this condition - it's the complexity of the US tax code. In the process, one eventually hits Schedule A, Line 6: Real Estate Taxes. For me, like you, that number just keeps growing. I looked back at my 1999 tax return just for fun - 13 years ago. Since then, our property taxes have grown 73%, equivalent to a compound annual growth rate of 4.25%. 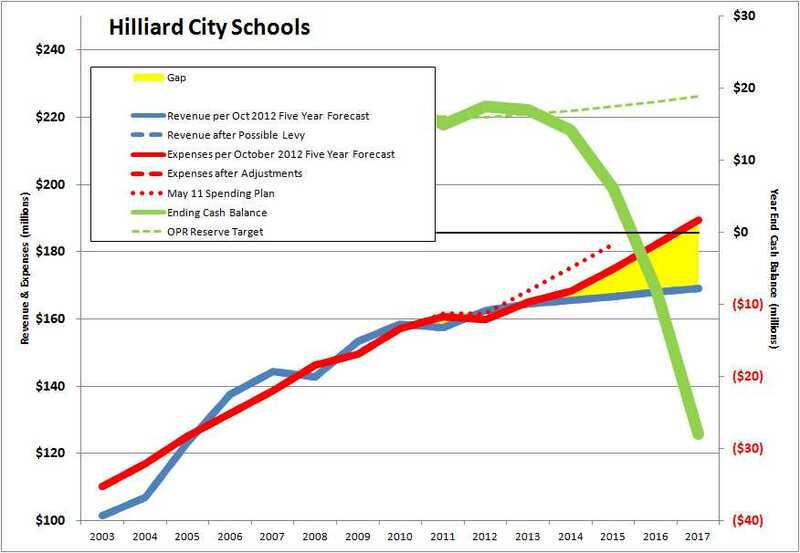 While around 65% of our current property tax bills are for Hilliard City Schools (your percentage may vary depending on the municipality you live in), I don't have data for what the breakdown was 13 years ago. So I can't say whether our school tax has grown more or less than the overall 4.25% CAGR, but I suspect it has been in that ballpark. When the last operating levy was passed in November 2011, the five of us on the School Board committed that it would be at least three years before another levy appeared on the ballot, provided we didn't get a big surprise from the State of Ohio. That still looks to be doable. How can we tell? As I've said many times, one of the most important documents produced by leadership of our school district is the Five Year Forecast. I say this not because money is the most important thing, but rather because money is the fuel we need to run the district, and we must always be cognizant of the rate it is coming in versus the rate it is being consumed. Many of our cars have a display called something like "Miles to Empty." It's the job of one of the myriad of processors in modern cars to divide the amount of gas remaining in the tank by the recent average fuel consumption rate (miles/gallon), and tell us about how far we can go before we're out. I have that display up all the time in my pickup truck to help me figure out if I need to buy gas now, or can maybe wait a couple of days and hope the price goes down. I can often stretch my decision time a little by taking action to reduce my rate of consumption. It says we'll run out of money in Fiscal Year 2016 (July 2015-June 2016). But we can't wait until then to make some tough decisions. For one thing, there is a time lag between when a levy is passed and the revenue starts showing up. When the levy passed in November 2011, it first appeared on our tax bill in January 2012, which is already halfway through FY12. This means that in FY12, only half the additional annual revenue was collected. The first year the full impact was seen was FY13. So if we don't want to run out of money in FY16, and we don't change our rate of consumption, that means the next levy has be passed in calendar 2014 - three years since the last levy was passed. The Rate of Spending Growth - currently forecasted at a rate of about 4% per year, around $7 million more each year. These factors are all related. 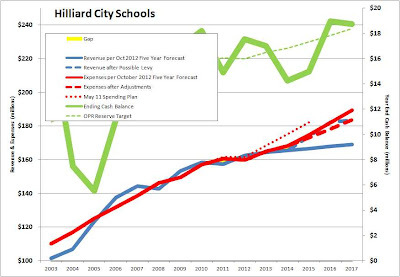 Let assume that we try to keep the cash reserves around 10%, don't want another levy on the ballot before 2017, and we keep the spending growth rate as currently forecasted. The math is straightforward: by my calculations (which is not confirmed by the Treasurer) the 2014 levy would need to be on the order of 7.7 mills, assuming that the funding by the State of Ohio remains as forecasted as well. Tall order. What if the 2014 edition of the School Board decides 5.9 mills - same as the 2011 levy - is all the community will accept? Again, assuming they will want to maintain a 3 year levy interval, keep cash reserves around 10%, and stick with the assumptions about State funding, then the rate of spending growth would have to drop from 4% per year to 3% per year. This is well past what can be done by making extracurricular activities self-funded, and by cutting high school busing. This would challenge all of us - parents, other community members, teachers, staff and administrators - to make some tough decisions. And we have to start working on this soon. The FY14 budget is already in place. That's the next school year after all, and it starts in ten weeks. If we don't figure out how to reduce the FY15 budget by around $1.7 million, the cuts will have to be even greater in FY16 and FY17. Frankly, this situation requires us all to find a compromise that spreads the impact across all constituent groups in a manner we can all live with, even if no one is completely happy. Our elected officials in Washington DC have been an embarrassment to our country in this regard, and our people in the Statehouse haven't been much better. But it's because we expect them to make someone else suffer while we are kept whole. Or that my political philosophy is correct, and yours is wrong. I hope we will have more success reaching compromise in our community. What better lesson can we teach our children if our school district and our nation is to survive? Back in February, I reported to you ("Don't Spend it Yet") that the first rendition of the Biennial Budget for the State of Ohio indicated that our Foundation Aid funding from the State of Ohio could increase by $5 million. That report was accompanied by a caution that this was unlikely to survive the budget process, which has lots of debate and dealmaking left. The Dispatch reporters who cover education just sent out a Tweet saying: "For all the central OH districts seeing 15, 20, 300% increases in Kasich's budget, House GOP changes caps at 6% per yr."
Since we are to receive $34.6 million in Foundation Aid in FY13, this cap - if true - would limit our additional state funding to $2.08 million - 60% less than the initial indications from the Governor's office. And the process isn't over yet. I don't know of anyone associated with our school district who believes we'll get any additional money from the State when it's all over. Here are the supplemental documents for the April 8, 2013 School Board meeting, to be held at 7pm at Darby High School. F1: Is the annual resolution directing the Franklin County Auditor to collect property taxes authorized by levies approved by the voters of our school district. F2-F4: Resolutions authorizing the operations department to do maintenance and improvement projects at our facilities, a normal summertime activity. F5: To enroll in a program to manage peak electrical load across our buildings. Being able to reduce the total load at times of peak demand (usually late afternoons in the summer) is worth a lot of money to the electric utilities, so incentive programs are being developed to encourage consumers, businesses and public institutions to allow the utilities to tell electricity users to cut back when high demand conditions occur. This EnerNOC deal allows us to participate in such a program. No downside, only savings. The last item I would call your attention to is F8, a resolution in opposition to the proposed expansion of the Ed Choice Scholarship Program, an element of the Education portion of the proposed Ohio Biennial Budget. First, let me say that my personal position is that it's a good thing for a society to commit that all its children will be given access to a decent education, and that it's reasonable to levy taxes as needed to make sure that this access is not abridged because of economic means. I believe this is a position that most American share. But even within that shared value, there is a broad spectrum of solutions. Unfortunately, we've become a nation that oscillates between the extremes, seemingly incapable of exploring the richness of possibilities in between. So every time the party in control of the state government changes, we get a new half-baked solution that swings us in the opposite direction, and doesn't really solve anything. The Governor and his allies in the General Assembly couldn't come up with a new education formula that they could get passed in the last biennium. So we ended up with a stop-gap scheme that mostly just carried forward the funding allocations used under the Strickland Evidence Based Model, which Kasich promised to get rid of (I wasn't a fan of the EBM either). It's now two years later, and the Kasich administration still doesn't appear to be any further along in getting a new funding system enacted. The school funding formula proposed in this budget, as introduced to the General Assembly as HB59, has received so much criticism that Rep. Ron Stebelton - Chair of the House Education Committee and member of the Finance and Appropriations Committee - sounds like he's ready to give up on it for now. So the lobbyists continue to work over the legislators in hope of getting their favorite programs and policies funded and those they dislike defunded. One of those lobbying groups is the Ohio School Boards Association, of which our school board is a member. OSBA has mobilized its resources to oppose the expansion of the Ed Choice Scholarship program, and is asking local school boards to get on the bandwagon by passing resolutions saying as much. OSBA wants to be able to go to the legislators and say something like "500 of Ohio's public school boards have passed resolutions in opposition to the expansion of the Ed Choice program." You hear stories about lobbyists writing the language of legislation brought before an elected body for enactment, and here's a concrete example. Item F8 is a verbatim version of the language recommended by the OSBA. I will be voting NO this resolution. Not because it was drafted by OSBA, but because I think the Ed Choice program should not be a threat to our school district, while it could literally be a life saver for kids trapped in bad schools. Although OSBA supports parental choice within the public school system, granting state-funded vouchers to students to attend nonpublic schools reduces the level of funding available to support and improve the public school system. - Uses public funds to expand voucher programs in nonpublic schools. - Expands vouchers, scholarships, tuition tax credits and similar programs at either the state or federal levels. While the adults in this whole education system continue to argue about how to fix schools which are failing now, and have been for years, more and more kids are having their once-in-a-lifetime opportunity to get a decent education squandered. The Ed Choice Scholarship program was designed to give poor kids in failing schools a means to go find a school which will give them a decent education. If that ends up being a different kind of school organized in a different way, I'm okay with letting that kid take his share of the state funding his failing school is getting, and letting a new group of folks have a shot. The kid is enrolled in a public school in grades K-3 and that school has, by 2016, been rated "D" or "F" in "making progress to improve K-3 literacy" for two of three prior years, provided the kid continues to live in the underperforming district, takes all the state mandated assessments that would be required in the public school, and has had no more than 20 excused absences. I can never see this condition applying to Hilliard City Schools. Beginning next school year, a kid would quality if the family income is below 200% of the federal poverty guidelines. This year, that would mean for a family of four, an income below $47,100. Only kids in kindergarten would be eligible the first year, followed by kindergarten and 1st grade the following year, then K-2 the next, and so on. Once enrolled in this program, a kid can remain in it through 12th grade. There are likely to be a fair number of kids in our district who qualify under the second condition. Our current kindergarten enrollment is 1,112, and our district-wide portion of kids who are classified as 'economically disadvantaged' is 24%, according to our latest State Report Card. A kid is said to be economically disadvantaged if household income is less than 130% of the federal poverty level. So let's estimate that perhaps 100 of our kindergarten kids might qualify for an Ed Choice scholarship. How many of them would actually go? I'd guess that very few would, but let's say it's half - 50 kids. What is the impact on our district? I could mean two fewer classrooms would be needed, and two fewer kindergarten teachers, but that's only if all those kids disappear from one or two buildings. We have 14 elementary schools, so it could be one or two kids from each one. There could be no reduction in the number of classrooms needed without a complex reconfiguration. Meanwhile, our funding from the state would decrease by about $5,500/kid, or $275,000. This is the concern of the opponents to this expansion - that public school district will lose revenue, but have no real reduction in cost. This is just the reality of running what is largely a fixed-cost enterprise: even though we quote a cost per student of $11,398/student, the real total cost changes materially only when the number of students changes by a fairly large number - like a whole building's worth. However, we also need to remember that the nearly $6,000/student we collect each year via local property taxes would stay with our district. 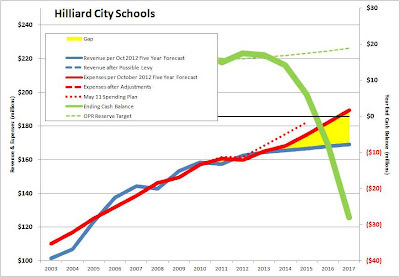 So when a student leaves the district, we have the same amount of local money to spend on fewer students. Carried to the absurd, we'd be better off economically if all the students left except for one, who would enjoy the benefits of $100 million of local taxes. So this second criterion could indeed cause a loss of funds if we can't compete successfully with the alternatives available to a qualifying student. I believe the moral objective in regard to education is to ensure that all children have access to a good education. Period. It seems that we should be happy if every kid has the opportunity to partake of a good education regardless of whether a child attends the public school in the school district in which they happen to reside, a public school in another school district, or a charter school. Our public school system is one of several solutions to that goal, and Hilliard City Schools is a great choice for the vast majority of kids. After all, the reason our community has grown so much in the past twenty years is because more and more people come here to enjoy the benefits of a great school district. Even those without children know that a good school district is an important component in maximizing property value. But that's not always the case in every school district. We need to accept that the current public school system traps some kids in schools that don't meet their needs, depriving them of a good education. That's because kids are assigned to school districts and buildings according to where they live, not what they need as individuals. The Ed Choice Scholarship program was designed to give those kids and their parents some options. I think we should give it a chance.